Did you know there were 235 bomb shelters built in the city of Brisbane during World War II, and that one of them remains in our Queen’s Wharf Brisbane precinct today? Built in the early 1940s, the bomb shelter is now being assessed for a potential transformation into one of our development’s 50 restaurants, cafes, and bars. Located on Queens Wharf Road, along the William Street retaining wall, it is one of only 21 bomb shelters that exist in the city today and was repurposed into a bus shelter from 1944 until the 1980s. During World War II, Queensland was used as a support base in the Pacific. As Australia’s most northerly major population centre, Brisbane became the military planning headquarters including maintenance, supply, and communication facilities. After the United States of America entered World War II following the Pearl Harbour bombing, then Queensland Premier William Forgan Smith ordered 200 bomb shelters to be built in the city in late December 1941. Another 75 shelters were ordered at a later stage, however, only 235 were constructed, including pillboxes down Elizabeth Street. The Queens Wharf Road bomb shelter is a variation of the standard pillbox design. It is 17.7 metres x 3.5 metres and was made using reinforced concrete, including its slab roof and internal blast walls, and had a doorway at the eastern end with steps down to an entrance at the north-west end. 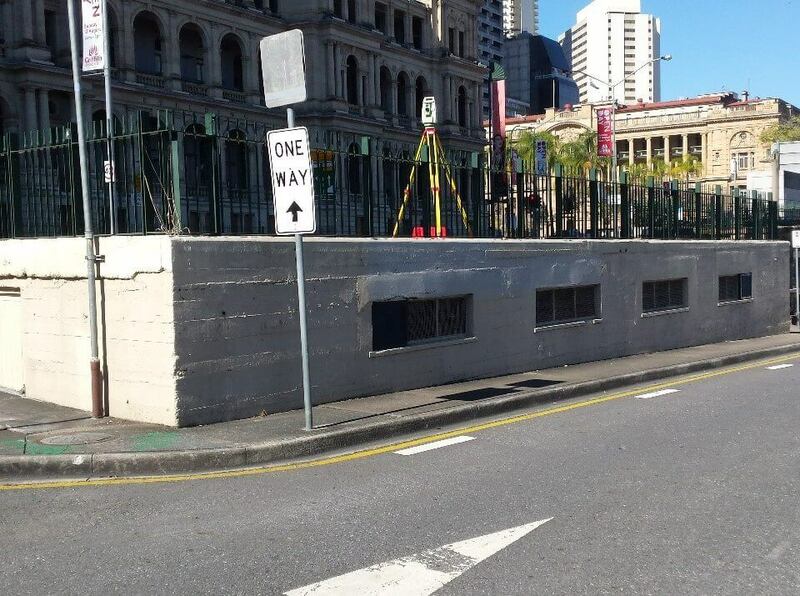 In 1944, a bus shelter, public telephones, and a drinking fountain were set up above the structure on the William Street footpath, resulting in a section of the wall parapet and railing being removed. It remained a bus stop until an underground bus station was constructed in the 1980s, featuring a tunnel entrance at the southern end of Queen Street. The ‘William Street bus shelter’ was demolished around 2008 and a new metal fence was constructed around the top of the bomb shelter. The other 20 remaining bomb shelters in the city, designed to hold 70 people each, were also used after the war as shade structures for parks or bus waiting shelters.